WorldSkills Leipzig 2013 counts down in style! A countdown clock situated in Leipzig Central Station is keeping track of the days until WorldSkills Leipzig 2013 which begins on 2 July. Elena Singer, member of the German national team and competing in Print Media Technology, unveiled the clock last week with the Mayor of Leipzig, Burkhard Jung. "The inhabitants of Leipzig are hospitable to the core", said Mr. Jung. "We want to amplify the WorldSkills-craze. This is an amazing event that is coming our way. It is THE Competition for skilled jobs." The countdown clock was made possible by contributions from Sparkasse Leipzig and the Industrial Initiative for Central Germany. explains Jörn-Heinrich Tobaben, CEO of the Industrial Initiative for Central Germany. After the unveiling, around 500 people, members of various city choirs, pedestrians and travelers sang Beethoven's "Ode to Joy". WorldSkills Leipzig 2013 staff informed visitors on the Central Station promenades about the Competition and held a raffle for free tickets. "The whole event was a big success, we were able to draw more attention to the Competition", said Hubert Romer, CEO of WorldSkills Leipzig 2013. 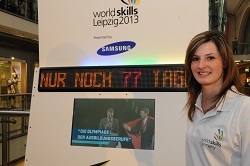 "When WorldSkills Leipzig 2013 begins we are certain that excitement will be great in Leipzig and the region."